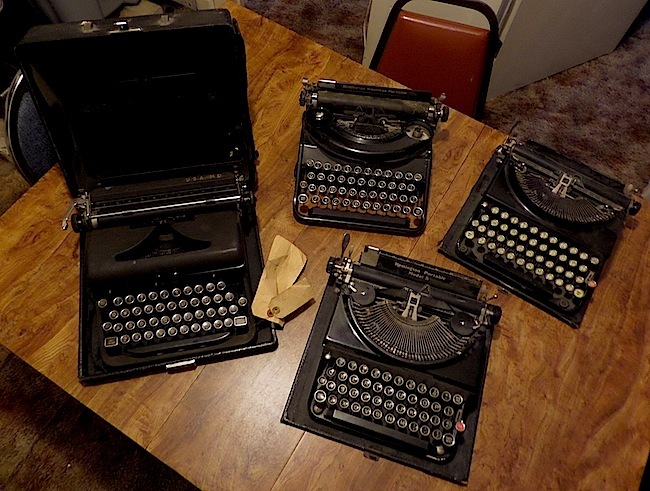 Truthfully, it was more like five Andrew Jacksons, but nevertheless, four machines for $100 from a former typewriter repairman who was glad to see them go. They are a bit dusty, but otherwise in fine shape. “Shift Freedom”? According to a Royal manual: “Either Shift Key puts into effect Shift Freedom, an original Royal feature which eliminates the noise and eyestrain of a bobbing carriage by lowering the type for capital letters instead of raising the carriage.” Apparently, it didn’t have anything to do with the war effort, which was my original thought. A special line of Arrows, however, was made for the U.S. Navy during World War 2, and one of these is featured at Machines of Loving Grace (see here). Perhaps, though, these Arrows were also made for other branches of the armed services. Mine is obviously from the medical corp. Navy? Army? Marines? I’m not entirely sure. I will be looking into this. What does it mean to join the typosphere?